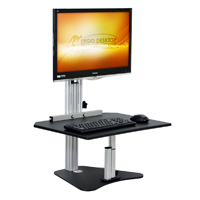 The One Touch Freestand from ErgoTech Group is an freestanding electric motorized desk add-on unit for creating a sit-stand workspace using an existing desk. The Freestand has two worksurface areas: one upper surface for placing documents or other desk objects and one lower surface for keyboard and mouse. Single and Dual monitor mounting kits can then be added to mount monitors using a VESA plate mechanism. The Freestand holds up to two 27" monitors at once (with a combined weight capacity up to 100 lbs total weight on both surfaces) and has a height adjustable range of 20". 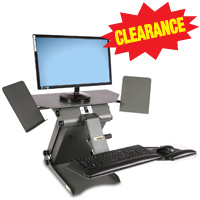 This Freestand unit comes with a front desk clamp mount so that the keyboard tray can be securely lowered below desk height when the user wants to sit. The front clamp makes the whole unit more secure on the desk. 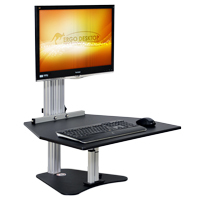 The One Touch Freestand comes with a base unit (including electric motor, a center monitor mounting pole, upper 13"x 28" and lower surface 10" x 28" worksurfaces) and a front desk clamp mount. Monitor Mounting Kits are purchased in addition to the base unit and desk clamp. Which kit to choose depends on how many monitors are to be deployed on the unit. 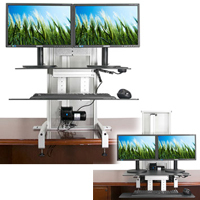 The ZipLift Sit-Stand Converter from iMovR converts any fixed-height desk into a height-adjustable work space. 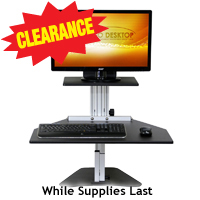 This sturdy and solid desk converter has infinite height adjustment of 13.8" with smooth movement and no bounce-back or settling after locking the desired height. At the highest setting with the upper platform at 20.6" above the desk, there is no detectable "wobbling" or movement of any kind of the mechanism, even when typing. 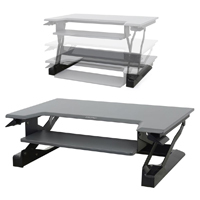 When raising the platform up, the platform and keyboard tray cantilevers forward, so that the user moves away from the stationary desk while standing. The upper platform for monitor, tablets, or documents is 35.4" wide by 15.7" deep, while the keyboard tray is 26.4" wide by 13" deep. Two hand-release levers are used to unlock the unit for adjusting up or down via the gas-cylinder Z-lift mechanism. Additional features include a 2" grommet hole at the back of the upper platform for attaching monitors, and a tilting mechanism (+/- 10°) for the keyboard tray for those who want their keyboard and mouse at a negative incline while standing. The Wallaby is an adjustable height desk which converts any ordinary desk into a sit-stand desk. It is free-standing (no clamping required) and easily moved to any position on the desk. The main keyboard platform adjusts up or down with the assistance of a gas cylinder (or lift), making quick adjustments throughout the day easy and effortless. This platform is generous compared to most keyboard trays at 28" wide and 24" deep and can be adjusted up to 16.5" above the desk. With the built-in "stopping bolt" feature, the user can raise the platform to a preset desired height every time. 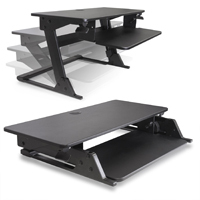 All Wallaby models also include a stabilization leg to practically eliminate worksurface vibration. A single monitor is attached to a monitor mount (or bracket) using a standard (75 or 100 mm hole pattern) VESA plate (included). The monitor mount allows for panning, tilting, or rotating the monitor from landscape to portrait positions. The Wallaby is designed so that the user sets the monitor at the desired height relative to the keyboard platform and it stays locked in that relative position, that is, the monitor will always move in tandem with the platform. There is an 7” height range of adjustment for setting this initial distance. It is this feature which differentiates the Wallaby from the Kangaroo, since the Kangaroo offers independent monitor height adjustment via a second gas cylinder. The Wallaby is recommended for monitors up to 15 lbs (without stand attached). For heavier monitors, customized units can be special ordered upon request. Le Wallaby est un bureau ajustable en hauteur qui transforme n`importe quel bureau ordinaire en bureau assis-debout. Il est sur pieds (un serrage n`est pas requis) et est facilement déplacé à n`importe quelle position sur le bureau. La plate-forme principale du clavier est ajustable en haut ou en bas avec l`aide d`un verin à gaz (gas cylinder or lift). Cette fonctionnalité permet aux utilisateurs de faire des ajustements rapidement facile et sans effort à travers de la journée. Cette plate-forme est plus grosse que les tablettes standard, de 28 po en largeur et 24 po de profondeur et peut être ajuster jusqu`à 16.5 po au-dessus du bureau. Avec le fonction d`un boulon d`arrêt, l`utilisateur peut monter la plate-forme à une hauteur préférée prédéfinie chaque fois. Toutes les modèles de Wallaby ont aussi un stabilisateur pour éliminer la vibration de la surface de travail. Un seul moniteur est fixé sur un support de moniteur (ou crochet) en utilisant la plaque standard (un schéma de trous soit de 75 ou 100 mm) VESA (inclus). Ce support de moniteur permet l`ajustement de positionner le moniteur panoramique, inclinaison, rotation, position paysage ou position portrait (landscape or portrait). Le Wallaby est conçu pour que l`utilisateur met le moniteur à l`hauteur préférable, relative au plate-forme du clavier et cela reste sécurer dans cette position relative, c`est-à-dire le moniteur va toujours bouger avec la plate-forme. Il y a une gamme d`hauteur de 7 po d`ajustement pour établir cette distance initial. C`est la caractéristique qui distingue le Wallaby du Kangaroo, car le Kangaroo offre l`ajustement indépendant du moniteur avec une deuxième verin à gaz (gas cylinder). Le Wallaby est recommandé pour les moniteurs qui pèsent jusqu`à 15 livres (sans la base attachée). Pour les moniteurs plus lourds des modèles personnalisés peuvent être commandés sur demandes. Disponible en noir, en rouge cerise, et en érable. Des accessoires supplémentaires pour étendre la surface de travail sont aussi disponible. The Electric Kangaroo Elite is an electric motorized version of the standard Kangaroo Elite. 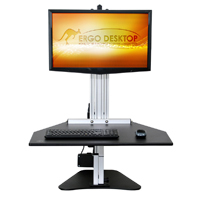 Like the standard Kangaroo Elite, the Electric Elite is a desktop add-on unit which converts any ordinary desk into a sit-stand desk. It is free-standing (no clamping required) and easily moved to any position on your desk. The main keyboard platform adjusts up or down by an electric motor (activated by a button switch), and is 28" wide and 24" deep with height-adjustability up to 20.5" above the desk, which will accommodate individuals who are up to 6' 8" tall. Monitors are attached to the monitor mounts using the standard VESA plates requiring 75 mm x 75 mm or 100 mm x 100 mm hole patterns. These monitor mounts allow for panning, tilting, or rotating the monitors from landscape to portrait positions. In addition, the monitors can be height-adjusted 6.5" independently of the keyboard platform using the gas cylinder mechanism. Extra features of the Electric Kangaroo Elite include an updated programmable button that lets the user know how high the desktop is, reminders for sitting or standing (these can be customized), built-in memory for up to 4 different heights, and Bluetooth access to all the above features via a phone app. In addition, the memory feature has an "impulse drive" function for automatically going to a pre-set location by using a simple double-click on the button. Finally, there is also included a 7" x 4" shelf as an extra storage space for phones, pens, etc. Note: All units come with one stabilization leg. For extra tall individuals over 6' 1", request the extra tall leg. Colour options (Black, Cherry, Maple) and additional accessories are also available. The Electric Kangaroo Pro is an electric motorized version of the standard Kangaroo Pro. 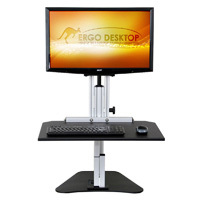 Like the standard Kangaroo Pro, the Electric Pro is a desktop add-on unit which converts any ordinary desk into a sit-stand desk. It is free-standing (no clamping required) and easily moved to any position on your desk. The main keyboard platform adjusts up or down by an electric motor (activated by a button switch), and is 28" wide and 24" deep. 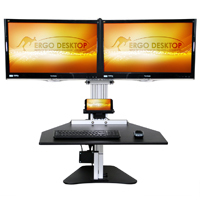 With height-adjustability up to 20.5" above the desk, the Electric Kangaroo Pro will accommodate individuals who are up to 6' 8" tall. The monitor is attached to the Kangaroo using the standard VESA plate (75 mm x 75 mm or 100 mm x 100 mm patterns). This versatile monitor mount allows for panning, tilting, or rotating the monitor from landscape to portrait position. In addition, the monitor can be height-adjusted 6.5" independently of the keyboard platform using the gas cylinder mechanism.